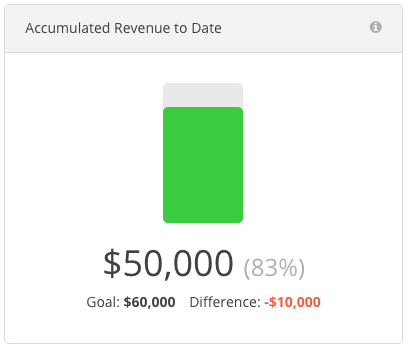 This widget shows you exactly how much accumulated revenue (invoice payments) you’ve received through the current month of the year, and compares it to where you should be (represented by the “Goal”) at this point in the year, and shows you the “Difference.” If you’re behind where you should be the difference will be a negative number which means you’re not on track to hitting your yearly revenue goal. If you’re ahead of where you should be the difference will be a positive number which means you’re on track to hitting your yearly revenue goal. Based on your current velocity Harpoon does its best to forecast how much revenue you might have by the end of the year. Like the Accumulated Revenue to Date widget described above, this forecast widget also displays the “Difference” between your forecasted revenue and your yearly revenue goal. To learn more about setting a yearly revenue goal view the Revenue Goal articles.